A mimic octopus trying to escape divers (including the photographer) tries to conform and move with the shape of brown algae along the sandy bottom of the Lembeh Strait. 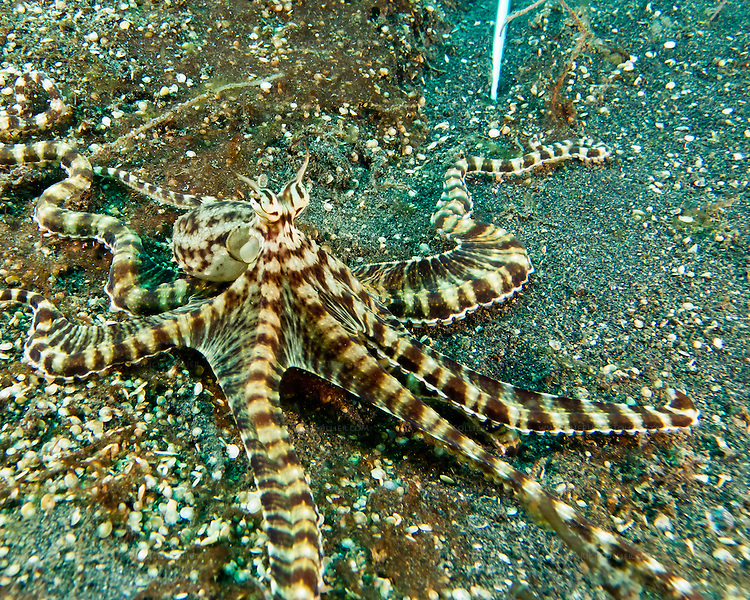 The mimic octopus was not discovered officially until 1998, off the coast of Sulawesi, Indonesia. This is the only octopus known to mimic the appearance and mannerisms other species. Mimic octopus have been known to imitate more than fifteen different species, including sea snakes, lionfish, flatfish, brittle stars, giant crabs, sea shells, stingrays, flounders, jellyfish, sea anemones, and mantis shrimp.